In October 2014 The Canal & River Trust appointed URBED, alongside consultants from Peter Brett Asociates, TPM Landscape, Hyder, Pell Frishmann and Grover Lewis, to produce a masterplan for the Sharpness Docks Estate which lies in-between Gloucester and Bristol on the Severn Estaury. The site is unique in its character; comprising a busy working dock, agricultural land, woodland and a marina running along the Gloucester and Sharpness Canal - and all lying adjacent to the River Severn. The Estuary is of a high value, designated as a Ramsar Site and covered by SSSI and SPA designations. The area has a rich maritime history, part of the site was the former Vindicatrix Camp -a training camp for young sailors from 1939 - and whom meet on the site annually for a reunion. Other parts of the site offer breathtaing views over the expanse of the estuary, which is in contrasts with the industrial sounds and heavy machinery of the working Dock. There are a number of important wildlife areas, homes to newts, badgers and breeding birds and areas with significant tree cover and mature trees. The team are progressing a masterplan for the estate which includes up to 300 homes, tourist facilities, a new marina, expanded dock employment space and green open space. The plans aim to adhere to best practice guidance in creating a development which respects the ecology of the site, promotes biodiversity and emphasises the landscape character. 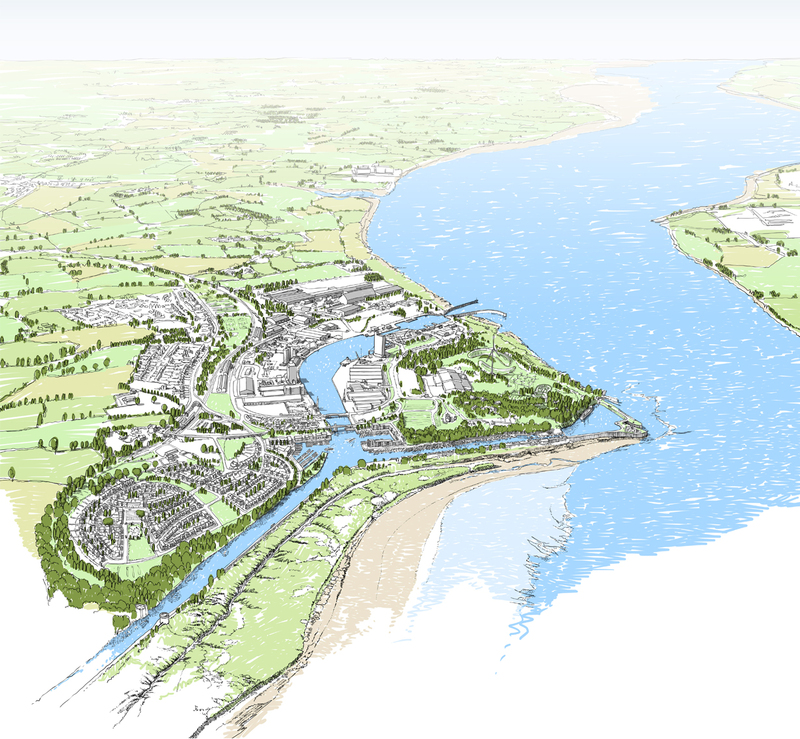 The masterplan also seeks to best connect the new areas to the existing built up area of Sharpness-Newtown. Four public consultation session have been scheduled for the project and the team is due to submit an outline planning application for the site in July/ August 2015. Please sign up to our mailing list here to recieve updates on progress and upcoming consultation dates. The exhibition boards are now available to view for the Sharpness Docks Estate public consultation! 2. Once you have looked at the boards please fill out an online feedback form here. 3. Sign up to our mailing list if you would like to be kept updated on the next consultation event here. The exhibition is up for the Sharpness Dock public consultation. Please see the boards under downloads for more information.